Althingi, the Icelandic parliament has just voted on whether four ministers should be brought before a special court ruling on ministerial responsibility and misdemeanour. The result is that only Geir Haarde, prime minister May 2007-Feb. 2009, will be charged. This means that the court will be convened. The three other ex-ministers that a parliamentary commission has also pointed out as culprits – Ingibjorg Solrun Gisladottir minister of foreign affairs and leader of the social democrats, Bjorgvin Sigurdsson from the same party and minister of trade and Arni Matthiesen minister of finance, from the conservatives – will not be charged. There will be many who find this awkward: if one leading minister failed in his job didn’t all the other ministers who were in charge of or responsible for the economy fail? Contacts between Iceland and Russia have for almost two decades been a source of speculations, some more fancifully than others. The speculations have now again surfaced in the international media following the focus on US president Donald Trump and his Russian ties: part of that story involves his connections with Bayrock where two Icelandic companies, FL Group and Novator, are mentioned. Contrary to the rumours at the time, Icelandic expansion abroad up to the banking collapse in 2008 can be explained by less sensational sources than Russian money – but there are some Russian ties to Iceland. “We have never seen businessmen who operate like the Icelandic ones, throwing money around as if funding was never a problem,” an experienced Danish business journalist said to me in 2004. From around 2002 to the Icelandic banking collapse in October 2008, the Icelandic banks and their largest shareholders attracted attention abroad for audacious deals. The rumours of Russian links to the Icelandic boom quickly surfaced as journalists and others sought to explain how a tiny country of around 320.000 people could finance large business deals by Icelandic businesses abroad. The owners of one of Iceland’s largest banks, Landsbanki, father and son Björgólfur Guðmundsson and Björgólfur Thor Björgólfsson, had indeed become rich in Saint Petersburg in the 1990s. 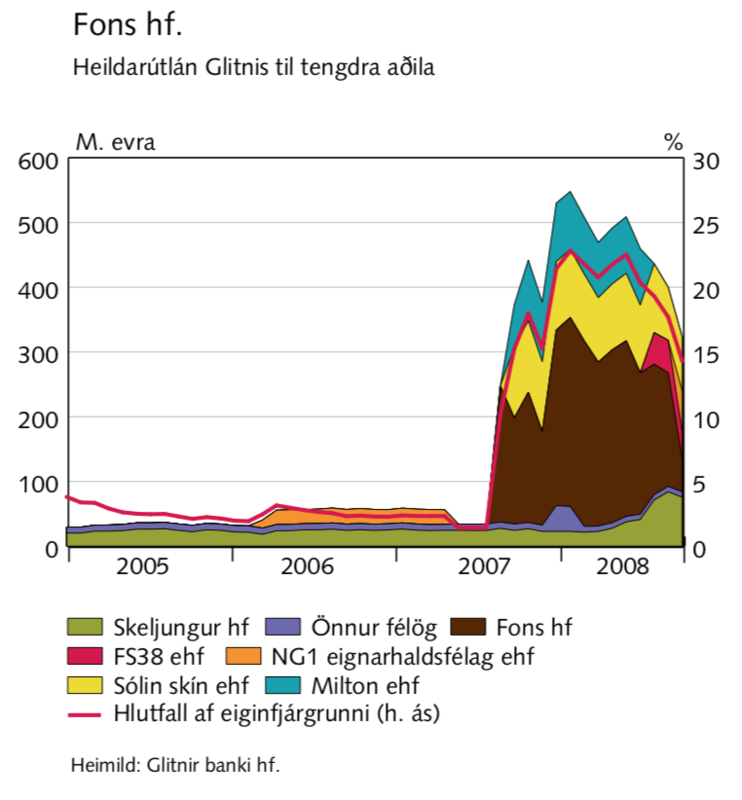 The unequivocal answer on how the foreign expansion of Icelandic banks and businesses was funded came in the Special Investigative Commission Report, SICR, in 2010: the funding came from Icelandic and international banks; the Icelandic banks found easy funding on international markets, the protagonist were at the same time the banks’ largest shareholders and their largest borrowers. The rumours of Russian connections have surfaced again due to the Bayrock saga involving US president Donald Trump and his relations to Russia and Russian mobsters. Time to look at the Icelandic chapter in the Bayrock saga and Russian Icelandic links. Tevfik Arif, born in Kazakhstan during the Soviet era, was a state-employed economist who turned to hotel development in Turkey in the 1990s before moving into New York property development where he founded Bayrock in 2001. As with many real estate companies Bayrock’s structure was highly complex with myriad companies and shell companies, on- and offshore. Arif hired a Russian to run Bayrock. Felix Sater or Satter was born in Russia in but moved to New York as youngster with his family. In 1991 Sater was sentenced to prison for a bar brawl cutting up the face of his adversary with a broken glass. Having admitted to security fraud in cohort with some New York Mafia families in 1998 he was eventually found guilty but apparently got a lenient sentence in return for becoming an informant for the law enforcement. In 2003, Arif and Sater were introduced to a flamboyant property developer by the name of Donald Trump, already a hot name in New York. One of their joint projects was the Trump Soho. The Trump connection did attract media attention. Apparently following a New York Times profile of Sater in December 2007, unearthing his criminal records, Arif dismissed Sater in 2008. By then, another scheme was brewing and that is where the Icelandic FL Group enters the Bayrock and Trump story. This part of the story has surfaced in court cases, still ongoing, where two ex-Bayrock employees, Jody Kriss and Michael Ejekam, are suing Bayrock for cheating them of profit inter alia from the Trump SoHo deal. Their story details complicated hidden agreements whereby Arif and Sater, according to Kriss and Ejekam, essentially conspired to skim off profit from Bayrock, cheating everyone who entered an agreement with them. According to the story told in the court documents (see inter alia here) Bayrock entered an agreement with FL Group in May 2007: for providing a loan of $50m FL Group would get 62% of the total profits from four Bayrock entities, expected to generate a profit of around $227.5m. The loan arrangement with FL Group did not make a great financial sense for Bayrock, again according to Kriss and Ejekam, but it was part of Arif and Sater’s scheme to cheat investors as well the US tax authorities. When Kriss complained to Sater that the $50m loan from FL Group was not distributed as agreed, Sater “made him (Kriss) an offer he couldn’t refuse: either take $500,000, keep quiet and leave all the rest of his money behind, or make trouble and be killed.” – Given Sater’s criminal record and threats he had made to another Bayrock partner Kriss left Bayrock. FL Group was one of the companies that formed the Icelandic boom. Out of many financial follies in pre-crash Iceland the FL Group saga was one of the most headline-creating. In 2002 Jón Ásgeir Jóhannesson, of Baugur fame, bought 20% in the listed air carrier Flugleiðir. In 2004 he teamed up with Hannes Smárason who with a degree from the MIT and four years at McKinsey in Boston had a stellar CV. Smárason was first on the board until he became a CEO in October 2005. The duo oversaw the take-over of Flugleiðir, sold off assets and turned the company into an investment company, FL Group; inter alia FL Group was for a short while the largest shareholder in EasyJet. In spring 2007, a group of investors led by Jóhannesson became the largest shareholder in Iceland’s third largest bank, Glitnir. Their Glitnir holding was through FL Group, consequently the bank’s largest shareholder. At the beginning of 2007, the FL Group debt with the Icelandic banks amounted to almost €600m but had risen to €1.1bn in October 2008. Interestingly, its debt to Glitnir rose by almost 800%. As mentioned above, Jóhannesson and his business partners, among them FL Group, became Glitnir’s largest shareholder in spring 2007, following the pattern that the banks’ largest shareholders were also their largest borrowers. FL Group – folly or a classic “pump and dump”? By the end of 2007, 26 months after Hannes Smárason became CEO, FL Group had set an Icelandic record in losses: ISK63bn, now €660m, ten times the previous record, from 2006, incidentally set by a media company controlled by Jóhannesson. Facing these stunning losses Smárason left FL Group in December 2007. The story goes that at the shareholders’ meeting where his departure was announced he left the room waving, saying “See you in the next war, guys” (In Icelandic: “Sjáumst í næsta stríði, strákar). There are endless stories of staggering cost and insane spending related to the FL Group boom and bust. Interestingly, a large part of the losses stemmed from consultancy cost for projects that never materialised. Smaller investors lost heavily and in hindsight the question arises if the FL saga was a folly or some version of a “pump and dump.” Smárason was charged with embezzlement in 2013, acquitted in Reykjavík District Court but the State Prosecutor’s appeal was thrown out of the Supreme Court due to the Prosecutor’s mistakes. FL Group never recovered from the losses and was delisted in the spring of 2008 and its name changed to Stoðir. FL Group never went into bankruptcy but its debt was written off. A group of earlier FL Group managers (Smárason is not one of them) now owns over 50% of Stoðir. Part of FL Group’s eye-watering losses was the Bayrock adventure. FL Group set up a company in Iceland, FL Bayrock Holdco, financed by the Icelandic mother company. Already in 2008 the FL Group Bayrock was a loss-making enterprise, its three FL Bayrock US companies were written off with losses amounting to ISK17.6bn, now €157m. When the Icelandic FL Bayrock finally failed in January 2014 Stoðir (earlier FL Group) was more or less the only creditor, its claims amounting to ISK13bn; no assets were found. According to the Kriss-Ejekam story, FL Group willingly and knowingly took part in a scam. When I approached a person close to FL Group, he maintained the investment had not been a scam but just one of many loss-making investments, not even a major investment, compared to what FL Group was doing at the time. An FL Group investor told me that he had never even heard of the Bayrock investment until the Trump-related Bayrock stories surfaced. He expressed surprise that such a large investment could have been made without the knowledge of anyone except the CEO and managers. He added however that this was perhaps indicative of the problems in FL Group: managers making utterly insane and ill-informed decisions leading to the record losses. Another Icelandic company, mentioned in the Kriss-Ejekam case is Novator, which was offered to participate in Bayrock. There is a whole galaxy of Novator companies, inter alia 19 in Luxembourg, encompassing assets and businesses of Björgólfur Thor Björgólfsson. During the early FL negotiations, Bayrock was approached by Novator, an Icelandic competitor of FL’s, which promised to go into the same partnership with Bayrock as FL was contemplating, and at better terms. Arif and Satter told Kriss that this would not be possible, because the money behind these companies was mostly Russian and the Russians behind FL were in favor with Putin, but the Russians behind Novator were not, and so they had to deal with FL. Whether or not this was true and what further Russian involvement existed must await disclosure. This is the clause that has yet again fuelled speculations of Russian dirty money in the Icelandic banks and Icelandic companies. As stated in the last sentence this is however all pure speculation. The story from the Novator side is a different one. In an email answer to my query, the spokeswoman for Björgólfsson wrote that Bayrock approached Novator Properties, which considered the project far from attractive. Following some due diligence Novator concluded that the people involved were not appealing partners, which led Novator to decline the invitation to participate. Towards the end of 2002 the largest Icelandic banks and their main shareholders were already attracting foreign media attention. Euromoney (paywall) raised “Questions over Landsbanki’s new shareholder” in November 2002 focusing on the story of the father and son Björgólfur Guðmundsson and Björgólfur Thor Björgólfsson, who with their business partner Magnús Þorsteinsson struck gold in Saint Petersburg in the 1990s and were now set to buy over 40% of privatised Landsbanki. The two businessmen, the Brit Bernard Lardner and his Icelandic partner Ingimar Ingimarsson, who in the mid 1990s had hired the three Icelanders to run their joint Saint Petersburg venture, were less lucky. In 2011 Ingimarsson published a book in Iceland, The Story that Had to be Told, (Sagan sem varð að segja), where he tells his side of the story: how father and son through tricks and bullying took over the Lardner and Ingimarsson venture, essentially the story told in Euromoney in 2002 (see earlier Icelog). As Griffith points out, Björgólfsson and his partners were operating in Saint Petersburg, “the city regarded as the Russian mafia capital. That investment was being made in the drinks sector, seen by the mafia as the industry of choice. Yet against all the odds, Bravo went from strength to strength. Other St Petersburg brewing executives were not so fortunate. One was shot dead in his kitchen from the ledge of a fifth-floor window. Another perished in a hail of bullets as he stepped from his Mercedes. And one St Petersburg brewery burned to the ground after a mishap with a welding torch. Björgólfsson has always vehemently denied stories of his alleged links to the Russian dark forces and Ingimarsson’s story. Billions to Bust and Back, published in 2014, is Björgólfsson’s own story of his life. The book has not been published in Iceland. The story told in the SICR is how the Icelandic banks essentially ran a double banking system: one for normal bank clients who got loans against sound collaterals and loan contracts with normal covenants – and then another system for what I have called the “favoured clients,” i.e. the largest shareholders and their business partners. The loans to the “favoured clients” were on very favourable terms, mostly bullet loans extended as needed, often with little or no collateral and light covenants. The consequence was that systematically, these clients profitted but if things went wrong the banks shouldered the losses. – In recent years, some of these abnormally favourable loans have sent around twenty bankers to prison. Although the Icelandic expansion abroad can be explained with less exciting facts than Russian Mafia and money laundering, there are a few tangible Russian contacts to Iceland: Vladimir Putin and the Kremlin did show an interest in Iceland at a crucial time, just as in Cyprus in 2013; Alisher Usmanov had ties to Kaupthing; the Danish lawyer Jens Peter Galmond, famous for his Leonid Reiman connections, and his partner Claus Abildstrøm did have Icelandic clients and Mikhail Fridman gets a mention. At 4pm Monday 6 October 2008 prime minister and leader of the Independence party (conservative) Geir Haarde addressed Icelanders via the media: the government was introducing emergency measures to deal with the banks in an orderly manner. Icelanders sat glued to their tv sets struggling to understand the meaning of it all. Haarde’s last words, “God bless Iceland,” brought home the severity of the situation. Icelanders had never heard head of government bless the country and never heard of measures like the ones introduced. The speech and the emergency Act it introduced came to be seen as the collapse moment – the three banks were expected to fail and by Wednesday 8 October they had all failed indeed. The next morning, 7 October 2008 as Icelanders woke up to a failing financial system, the then governor of the Icelandic Central Bank, CBI, Davíð Oddsson, an earlier leader of the Independence Party and prime minister, told the still shocked Icelanders that all would be well: around 7am Victor I. Tatarintsev the Russian ambassador in Iceland had called Oddsson to inform him that the Russian government was willing to lend €4bn to Iceland, bolstering the Icelandic foreign reserves. According to the CBI press release the loan would be at 30-50bp above Libor and have a maturity of three to four years. Later that day another press release just stated that representatives of the two countries would meet in the coming days to negotiate on “financial issues” – no mention of a loan. According to Icelog sources, the morning news was hardly out when the CBI heard from news agencies that Russian minister of finance Alexei Kudrin had denied the story of a Russian loan to Iceland; indeed the loan never materialised though some CBI officials did fly out to Moscow a week later. There have of course been wild speculations as to if the offer was real, why Kremlin was ready to offer the loan and then why Kremlin did, in the end, not stand by that offer. Judging from Icelog sources it seems no misunderstanding that Tatarintsev mentioned a loan to Oddsson. As to why Kremlin – because that is where the offer did come from – wanted to lend or at least to tease with the offer is less clear though there is no lack of undocumented stories. One story is that some Russian oligarchs did have money invested in Iceland. Fearing their funds would be inaccessible they pulled some strings but when they realised their funds were not in danger they lost interest in helping Iceland and so did Kremlin. Another explanation is that Kremlin just wanted to tease the West a bit, make as if it was stretching its sphere of interest further west. Yet another story is that a European minister of finance called his Russian counterpart telling him to stay away from Iceland; the European Union, EU would take care of the country. Iceland found in the end a more conventional source of emergency funding: by 19 November 2008 it had secured $2.1bn loan from the International Monetary Fund, IMF. In 2013, Russia played the same game with Cyprus: it teased Cyprus with a loan. The difference was however that the Russian offer to Cyprus did not come as a surprise: Russia had long-standing and close political ties to the island. Russian oligarchs and smaller fries had for years made use of Cyprus as a first stop for Russian money out of Russia. At the end of 2011, Russia had lent €2.5bn to Cyprus. However, the crisis lending did not materialise, any more than it had in Iceland (see my Cyprus story). After the 2008 collapse in Iceland a credible source told me he had seen a US Department of Justice classified report on money laundering stating that Icelandic banks were mentioned as open to such flows. Given the credibility of the source I have no doubt that the report exists (though all my efforts to trace it have failed). I have however no idea if that report was thoroughly researched or not nor in what context the Icelandic banks were mentioned. Some Icelandic banks did have clients from Russia and the former Soviet Union. The only one mentioned in the SICR, is the Uzbek Alisher Usmanov. He turned to Kaupthing in summer of 2008 when he was seeking to buy shares in Mmc Norilsk Adr. According to the SICR the bank also sold Usmanov shares in Kaupthing – by the end of September 2008 he owned 1.48% in the bank. I am told that Usmanov was not Kaupthing client until in the summer of 2008 (earlier Icelog). Funding was generally drying up but Kaupthing was keen on the connection as it was planning to branch out to Russia and consequently looking for Russian connections. If Usmanov’s shareholding in Kaupthing comes as surprise it is important to keep in mind that part of Kaupthing’s business model was to lend money to clients to buy Kaupthing shares. This was no last minute panic plan but something Kaupthing had been doing for years. This model, which looks like a share-parking scheme, is a likelier explanation for Usmanov’s stake in Kaupthing rather than a sign of Usmanov’s interest in Kaupthing. A Kauphting credit committee minute from late September 2008, leaked after the collapse, shows that Kaupthing had agreed to lend Usmanov respectively €1,1bn and $1.2bn. According to Icelog sources the bank failed before the loans were issued. There are two Icelandic links to Mikhail Fridman, through Kaupthing and the investment bank Straumur. Its chairman, largest investor and eventually largest borrower was Björgólfur Thor Björgólfsson. By 1998, Kaupthing was operating in Luxembourg. In June that year, a Luxembourg lawyer, Francis Kass, appeared twice on the same day as a representative of two BVI companies, Quenon Investments Ltd and Shapburg Ltd, both registered at the same post box address in Tortola. His mission was to set up two companies, both with names linked to the North: Compagnie Financiere Scandinave Holding S.A. and Compagnie Financiere Pour L’Atlantique du Nord Holding S.A. The directors were offshore service companies, owned by Kaupthing or used in other Kaupthing offshore schemes. These two French-named companies, founded on the same day by the same lawyer, came to play major roles in the Icelandic boom until the bust in October 2008. The former was for some years controlled by Kaupthing top managers until it changed name in 2004 to Meiður and to Exista the following year. By then it was the holding company for Lýður and Ágúst Guðmundsson who became Kaupthing’s largest shareholders, owning 25%. In 2000, the latter company’s name changed to Gaumur. Gaumur was part of the Baugur sphere, controlled by Jón Ásgeir Jóhannesson. The owners of Exista and Baugur were dominating forces in the years when Icelandic banks and businesses were on their Ikarus flight. Apart from the UK, the Icelandic business expansion abroad was most noticeable in Denmark. Danish journalists watched with perplexed scepticism as swaggering Icelanders bought some of their largest and most eye-catching businesses. In Iceland, politicians and business leaders talked of Danish envy and hostility, claiming the old overlords of Iceland were unable to tolerate the Icelandic success. They were much happier with the UK press that followed the Icelandic rise rather breathlessly. In 2006 the Danish tabloid Ekstra bladet wrote a series of articles again bringing up Russian ties. Part of the coverage related to the two Krass companies: Quenon and Shapburg have also set up Alfa companies, part of Mikhail Fridman’s galaxy of on- and offshore companies. The Danish articles were translated into English and posted on the internet. Kaupthing sued the Danish tabloid, which was forced to retract the articles in order to avoid the crippling costs of a libel case in an English court. An adversary of Fridman, with Icelandic ties, figures in a long saga where also Usmanov plays a role: the Danish lawyer, Jeffrey Peter Galmond. – Some of the foreign fixers who have worked for ex-Soviet oligarchs have in some cases lost their lives under mysterious circumstance. JP Galmond lost his law firm. His story has been told in the international media over many years (my short overview of the Galmond saga). Galmond was one of the foreign pioneers in St Petersburg in the early 1990s where he soon met Leonid Reiman, manager at the city’s telephone company. By the end of 1990s many foreign businessmen had learnt there was not a problem Galmond could not fix. Reiman went on to become a state secretary in 1999 when Boris Jeltsin made his Saint Petersburg friend Vladimir Putin prime minister. By 2000 the Danish lawyer had turned to investment via IPOC, his Bermuda-registered investment fund. The following year he bought a stake in the Russian mobile company Megafon. Soon after the purchase Mikhail Fridman claimed the shares were his. This turned into a titanic legal battle fought for years in courts in the Netherlands, Sweden, Britain, Switzerland, the British Virgin Islands and Bermuda. In 2004 Galmond’s IPOC had to issue a guarantee of $40m to a Swiss court in one of the innumerable Megafon court cases. The court could not accept the money without checking its origin. An independent accountant working for the court concluded that the intricate web of IPOC companies sheltered a money-laundering scheme. In spring of 2008 IPOC was part of a criminal case in the BVI. That same spring, the Megafon battle ended when Alisher Usmanov bought IPOC’s Megafon shares. The Megafon battle exposed Galmond as a straw-man for Leonid Reiman who was forced to resign as a minister in 2009 due to the IPOC cases. In 2007, Galmond was forced to leave his law firm due to the Megafon battle; his younger partner Claus Abildstrøm took over and set up his own firm, Danders & More, in 2008. In spite of the international media focus on Galmond, he and his partner Claus Abildstrøm enjoyed popularity among Icelandic businessmen setting up business in Copenhagen. An Icelandic businessman operating in Denmark told me he did not care about Galmond’s reputation; what mattered was that both Galmond and Abildstrøm understood the Icelandic mentality and the need to move quickly. Already in 2002, Abildstrøm had an Icelandic client, Birgir Bieltvedt, a friend and business partner of both Björgólfur Thor Björgólfsson and Jón Ásgeir Jóhannesson. In 2004 Abildstrøm assisted Bieltvedt, Jón Ásgeir Jóhannesson and Straumur investment bank, where Björgólfsson was the largest shareholder, to buy the department store Magasin du Nord, where Abildstrøm then became a board member. In 2007, when the IPOC court cases were driving Galmond to withdraw from his legal firm, the Danish newspaper Børsen reported that among Galmond’s clients were some of the wealthiest Icelanders operating in Denmark, such as Björgólfur Thor Björgólfsson and Jón Ásgeir Jóhannesson. In his book, Ingimar Ingimarsson claimed that Galmond acted as an advisor to Björgólfsson. According to an Icelog source Galmond represented a consortium led by Björgólfsson’s father Björgólfur Guðmundsson when they bought a printing press in Saint Petersburg in 2004. Björgólfsson has denied any ties to Galmond and to Reiman but has confirmed that Abildstrøm has earlier worked for him. Pamplona Capital Management is a London-based investment fund, which in late 2007 entered a joint venture, according to the SICR, with Straumur, an investment bank where Björgólfur Thor Björgólfsson was the largest shareholder, chairman of the board and Björgólfsson-related companies were eventually the largest borrower (SICR). In 2005 Pamplona had bought a logistics company, ADR-HAANPAA, operating in the Nordic countries, the Baltics, Poland and Russia. In 2007 Straumur provided a loan of €100m to refinance ADR in a structure where Pamplona owned 80.8%, Straumur 7.7% and ADR managers the rest. Pamplona was set up in 2004 by the Russian Alexander Knaster, who as a teenager had immigrated to the US with his parents. Knaster was the CEO of Fridman’s Alfa Bank from 1998 until 2004 when he founded Pamplona, partly with capital from Fridman. Knaster has been a British citizen since 2009 and has, as several other Russian billionaires living in the UK, donated money, £400.000, to the Conservatives. Incidentally, Pamplona shares the same London address as Novator, Björgólfsson’s investment fund, according to Companies House data: 25 Park Lane is one of London’s most attractive business addresses. Big banks such as Wachovia and Citigroup have been fined for facilitating money laundering for Mexican gangs. Deutsche Bank as been fined recently for doing the same for Russians with ties to president Trump. All of this involves violating anti-money laundering rules and regulations and this criminal activity has almost invariably only been discovered through whistle-blowers. Since large international banks could get away with laundering money, could something similar have been going on in the Icelandic banks? The Icelandic Financial Supervisor, FME, was famously lax during the years of the banks’ stratospheric growth and expansion abroad. One anecdotal evidence does not inspire confidence: during the boom years an Icelandic accountant drew the attention of the police to what he thought might be a case of money laundering in a small company operating in Iceland and offshore. The police seemed to have a very limited understanding of money laundering other than crumpled notes literally laundered. However, the banking collapse set many things in motion. The failed banks’ administrators, foreign consultants and later experts at the Office of the Special Prosecutor have scrutinised the accounts of the failed banks landing some bankers and large shareholders in prison. I have never heard anyone with plausible insight and authority mention money laundering and/or hidden Russian connections. I do not know if it was systematically investigated but some of those familiar with the failed banks would know that money laundering, though of course hidden, leaves a certain patterns of transactions etc. But most importantly, the banks’ operation in Luxembourg, where in the Kaupthing criminal cases the dirty deals were done, have not been scrutinised at all by Luxembourg authorities. The Icelandic businessmen most active in Iceland and abroad were famous for two things: complex structures, not an Icelandic invention – and buying assets at 10-20% higher prices than others were willing to offer. As one Danish journalist asked me in 2004: “Why are Icelanders always willing to pay more than the asking price?” The Icelandic businessmen explained this by “time is money” – instead of wasting time to negotiate pennies or cents it paid off to close the deals quickly, they claimed. Paying more than the asking price, exorbitant consultancy fees, sales at inexplicable prices to related parties and complicated on- and offshore structures are all known characteristics of systematic looting, control fraud and money laundering – and there are many examples of all of this from the Icelandic boom years. But these features can also be the sign of abysmally bad management. After the banking collapse in October 2008, three things were set in motion by the government at the time (Independence Party, together with the Social Democrats): an investigation into the causes of the collapse, rewriting the constitution and an Office of a Special Prosecutor. The investigation was concluded with a report of 2400 pages published April 10 2010; so far, no country has done a comparable report on the financial crisis in 2008. Rewriting the constitution was not finished in the way intended due to a political backlash. The government now plans to review OSP’s role although the OSP was made a permanent serious fraud office in 2011 – and starve it of funds while the review is ongoing. It did not start too well: after Althing passed an Act in December 2008 to set up an office of a special prosecutor to investigate possible fraud related to the banking collapse no one applied. Finally, Ólafur Þór Hauksson stepped forward, a sheriff (called “sýslumaður” in Icelandic) from Akranes, the village on the other side of the gulf from Reykjavík. Though having no previous expertise in Iceland to build on, the OSP has built up the expertise and know-how in investigating fraud such as market manipulation, insider trading, embezzlement and breach of fiduciary duty. So far, six OSP cases have found their way all the way to the Icelandic Supreme Court: five ended with sentencing, one with acquittal. The Icelandic decision to investigate possible fraud within the banks has been much noticed around the world where financial institutions often seem like holy cows, too powerful to investigate and bankers too important to jail. Examiner Anton Valukas who led the investigation into Lehman Brothers’ demise pointed out certain accounting practice, so called Repo 105, which according to the report seemed to have the sole purpose of balance sheet manipulation (see here on Valukas and the SIC report). Valukas has later clearly expressed bafflement that no charges have been filed regarding Lehman. – In Iceland, irregularities regarding the operations of the banks are being investigated and bankers prosecuted as well as other high-flying businessmen. With the present coalition government of the Progressive Party and the Independence Party (which led the government that set up the OSP; ex-PM Geir Haarde said on Rúv tonight it had been a good step), the tone is now changed: the OSP is being starved of funds in the 2015 budget. The government claims it is going to review the OSP operation. Interestingly, it is going to starve it first and then review it. The government seems to ignore that fact that since the law on the OSP was changed in 2011 so as to turn it into a permanent serious fraud office, there is no burning need to come up with changes of purpose and mission. In numbers (from a recent Rúv interview with Hauksson): the OSP budget for this year is ISK900m, €5,9m; for next year its share in the budget is ISK295m, or a cut of 67%. Sixteen employees were recently fired because of the envisaged funding cuts. With the present prospect for 2015 staff will go from seventy to twenty. The number of cases now under investigation is 96; 39 of them are related to the collapse. The planned cuts also mean that opening investigations into new cases will be problematic; the outlook for seeing charges through court is uncertain. Just to give an idea on the OSP present activity: these days, the OSP’s most extensive case so far is in the Reykjavík District where Landsbanki’s CEO Sigurjón Árnason and three Landsbanki employees are charged with market manipulation. This weekend, Rúv brought news of charges against four Spron board members and Spron CEO Guðmundur Hauksson (not related to Special Prosecutor Hauksson) relating to an ISK2bn, now €10m, loan to Exista; Guðmundur Hauksson had shares in Exista and long-time relationship with that company, the largest shareholder of Kaupthing. In January, the so-called al Thani case is coming up in the Supreme Court; appeal of the Reykjavík District Court where Kaupthing CEO Hreiðar Sigurðsson was sentenced to 5 1/2 years, executive chairman Sigurður Einarsson 5 years, Kaupthing’s second largest shareholder Ólafur Ólafsson 3 1/2 years and Magnús Guðmundsson manager of Kaupthing Lúxemborg 3 years. The furious battle of interest in Iceland regarding the estates of Glitnir and Kaupthing ultimately centres on the ownership of the new banks, respectively Íslandsbanki and Arion owned by the two estates. There is the IMF – some “foreign abbreviation” as prime minister Sigmundur Davíð Gunnlaugsson once said – together with some civil servants and politicians who want to find a common ground with the creditors and settle on a composition agreement. Then there are those who argue for a tough treatment of the creditors, bankrupting the estates and turning all their króna holding into fx. Choosing the next governor of the Central Bank of Iceland, CBI, will indicate who is in charge and which steps will be chosen regarding the estates and ultimately in lifting the capital controls. Control-watchers and others who follow things in Iceland are eagerly waiting to see who will be appointed the new governor of the Central Bank of Iceland. The governor will be a key player in lifting the controls and deciding on the fate of the new banks and how the estates will be dealt with. The decision is also a test for minister of finance Bjarni Benediktsson – does the independence of the CBI matter to him or is he at ease with political meddling in the bank, contrary to the advice of the International Monetary Fund, IMF, which in its last report stressed the importance of an independent central bank. The whole affair of appointing – or not appointing – a new CBI governor has been a bit of a drama. During winter there were continuous speculations regarding possible changes at the CBI. A few times in the course of the winter prime minister Sigmundur Davíð Gunnlaugsson criticised the bank and its staff severely, i.e. for not being in awe of his great project, the “Correction” or the writing-down of mortgages for those who are able to pay and had therefore not benefitted from earlier write-downs. Until the 11th hour, literally, it seemed that in spite of it all, present governor Már Guðmundsson would stay in place. After all, it seemed unlikely that the government would act only at the latest moment. But that is what it did – hours before the time lapsed: if nothing had been done, Guðmundsson would automatically have been reappointed for another five years. Then came the next step: appointing a selection committee to evaluate the applicants. Now imagine if the head of Scotland Yard would have been the head of a committee selecting a new governor of the Bank of England – does it sound far-fetched and utterly ridiculous? None the less this is what happened in Iceland: head of the Icelandic police was chosen to head the selection committee with a lawyer who is the Independence party representative on the board of the CBI and earlier an MP for the party together with – finally – a well-merited professor emeritus of economics. Out of three members only one was an economist and the other two had no special insight into central banking, apart from one being on the CBI board. The curious outcome seems to stem for a general reluctance among some suitable candidates for the selection committee to be on it. The committee’s written decision has not been published but apparently they placed three applicants equal: Guðmundsson and then two professors: professor of the University of Iceland Ragnar Árnason whose speciality is fishing and Friðrik Már Baldursson professor at Reykjavík University who is a well-merited academic who fell out of favour in Iceland after the collapse because a much disputed report on the Icelandic economy he wrote together with professor Richard Portes. However, to place these three as equal is rather distorting the merits of the three applicants: in terms of experience and career there is no way of placing these three as equal. Guðmundsson is by far the best candidate but in a country where political and personal interests matter, often obliterating professional merits, strong and clear merits are not always enough. There are now wild speculations in Iceland as to what Benediktsson will do and what the appointment will indicate in terms of domestic politics. Árnason has been seen as the most likely candidate to be appointed because of his strong ties to the Independence party. He has i.a. been the party’s representative in various ways over the last decades, written reports etc. Also, he is thought to be favoured by the invisible power centre around Morgunblaðið’s editor ex-prime minister Davíð Oddsson. What many worry is that Árnason, having been involved in various disputes at the University, is seen as a difficult person to work with. One speculation is that because of this Baldursson might be a compromise candidate. If it is true that Oddsson has any say in this he might not be too thrilled at the thought of Baldursson at the CBI. Baldursson was instrumental in bringing the IMF to Iceland during the days of crisis, at which time Oddsson was himself the governor of the CBI, staunchly opposing an IMF involvement. Oddsson lost that battle. Now, does that leave Guðmundsson as the best candidate from the point of view of not only merits but also interests? Remains to be seen and it would surely be ironic since it is thought that this whole saga of appointing a new governor did indeed start because the prime minister (and probably Oddsson) wanted to get rid of Guðmundsson. Another twist in the CBI saga is that home office minister Hanna Birna Kristjánsdóttir is fighting for her political life due to a leak from her ministry regarding the case of an asylum seeker. A case that has been brewing for ca. a year and gets ever more convoluted and difficult for the minister. There are voices that she should simply resign, at least not be in office while there is an ongoing investigation, now involving the state prosecutor and the Alþingi Ombudsman. While Stefán Eiríksson the head of the Iceland police, was the chairman of the CBI selection committee and working on the selection process, he was also applying for a lower-level job with the Reykjavík council as head of its welfare department, which he got just some days ago. According to Icelandic media it now seems he wanted to leave his job because of alleged pressure the minister. Some weeks ago Morgunblaðið suddenly and apparently out of the blue attacked the Alþingi Ombudsman Tryggvi Gunnarsson for views held in an email. It then turned out this infamous email was by the Ombudsman’s namesake. This was rather incomprehensible at the time but now that the Ombudsman is on Kristjánsdóttir’s case the paper’s attempt to discredit Gunnarsson can be seen to acquire another meaning. Benediktsson has been unwilling to criticise Kristjánsdóttir but has now given her a half-hearted support in the media. She has been his most dangerous opponent in the party and widely seen as someone who is waiting to challenge him in a leadership contest. With her gone from the political scene there would be no one he needed to fear. And those who want to keep a tight rein on him or oppose him would have no leverage against him. The leak saga is very much in the Icelandic media. Another news was thrown out just before the last weekend when travels of Icelanders in Iceland traditionally peak: the minister of foreign affairs Gunnar Bragi Sveinsson (Progressive) has appointed two new ambassadors – ex-prime minister Geir Haarde of the Independence party and Árni Þór Sigurðsson MP for the Left Green (here is Rúv’s report on this new appointment with a photo of Haarde, as PM, giving his “god bless Iceland” speech at 4pm on October 6 2008 where he told Icelanders that the banking system was collapsing). Haarde was found guilty by a special court regarding his part in the collapse in 2008 but not sentenced (see here some Icelogs on the Haarde trial and its aftermath). A clever move because the left/opposition now stays silent and not a word of criticism is heard. A politician has not been appointed an ambassador since 2008 and many had probably thought that this kind of political meddling might be a history of the past. Not quite. In order to understand the coming appointment of the CBI governor it is necessary to keep all of this in mind because these are political side-shows. Many see the CBI appointment as a test for Benediktsson: whose interests is he serving, does he really decide or does Gunnlaugsson decide on everything he deems of interest to him and his party? The fact that it is taking so long to decide – a decision was expected end of last week – indicates that the appointment is a bone of contention. This is an important test for Benediktsson. Also because the IMF has strongly warned the government not to the diminish the independence of the CBI, most recently in its last report: “Maintaining a financially sound, independent, and accountable central bank is important for policy credibility and anchoring inflation expectations, which in turn supports stability and growth.” (See my take on the IMF report here). Why the fuss about the governor? Because he will not only be important in fighting inflation, supporting stability and growth. The governor will be instrumental in deciding on the fate of Glitnir and Kaupthing and now the new banks, Íslandsbanki and Arion will be sold. Will there be a political horse trading in distributing the goods, i.e. the two banks, involving a fight with foreign creditors and disorderly routes – or will there be an orderly lifting of the capital controls, as the IMF is in favour of? The new governor will very much set the tone in all these issues. *Earlier today, August 6, the Ombudsman sent a letter to Kristjánsdóttir to enquire further re the leak, i.e. what and how often she talked about the leak to Eiríksson, the police chief. In addition, the Ombudsman sent a letter to the prime minister inquiring if ethical rules for ministers, set by the last government and expiring as it left office, have been replaced by another set of ethical rules. (A link to the two letters, in Icelandic, is here). – Further, to the Morgunblaðið’s failed attack on the Ombudsman see the end of my earlier blog, here. Update Aug. 7: the minister of finance was expected to announce today or tomorrow who would be appointed as the next governor of the CBI. It now seems likely that no decision is forthcoming until next week. The rumour is that different factions within the government can’t agree. There clearly are strong tensions, indicating that there is much at stake. Last week started with a TV interview where prime minister Sigmundur Davíð Gunnlaugsson spent the best of half an hour arguing with the journalist, much to the dismay of many TV watchers. Then there was a report on Iceland and the EU, which led to the government deciding to break off EU membership negotiations, in spite of earlier promises to vote on continued negotiations; a decision ex prime minister Þorsteinn Pálsson called the greatest political betrayal in Icelandic history. And lastly, it was also last week that the government, at the 12th hour, announced it was going to take time to set up a committee to ponder on changes, or not, at the Central Bank. This which means that the CBI will clearly not be taking any major decisions until new governor(s) are in place, which again must set some creditors thinking – and perhaps also some Icelanders. For two days protesters have gathered outside the Icelandic Alþingi, parliament. It is not an angry mob, more like a crowd during an interval at a theatre waiting patiently for the second half. What started out as an awkward election promise is now a millstone around the neck of prime minister Sigmundur Davíð Gunnlaugsson but more seriously minister of finance and leader of Independence Bjarni Benediktsson. At the time, Benediktsson himself now against Icelandic membership of the European Union (but pro EU some years ago) but trying to avoid alienating pro-EU voters, eased out of anything final on the matter by promising a referendum on continuing the negotiations or not. Both parties promised in no uncertain terms that they would not break off negotiations without a referendum but instead hold a referendum on whether to continue the membership negotiations. What the two parties had not foreseen was that there would be a clear majority for continuing. Many voters now seem to feel that this promise has been broken in spite of the coalition parties offering various different version of actually-not-broken-promise. The government had said it would make up its mind on EU after a report it had promised already last autumn. Now that the report is out, a balanced overview of the negotiations and options, the government intends to skip earlier promise and instead break off the negotiations without any further ado. It even seemed to want to rush the matter through parliament last week, holding a parliamentary debate only a day after the 1000 pages report had been published thus giving MPs no time to study the report but it was forced to change its tempo and give more time. This awkward promise of a referendum on continued negotiations now haunts the government. Benediktsson tries to spin it as being impossible to continue though he struggles to explain what should have changed since the promise was given. He did however say in a TV debate last night that he could “not completely” keep his promise. This issue is particularly difficult for Benediktsson, less for Gunnlaugsson whose party is firmly against EU membership. Although opinion polls indicate that majority of Independence party voters are against EU membership the business elite, except for those with interests in the fishing industry, is for membership. This is turning into a major problem for the government. One Independence party member, Vilhjálmur Bjarnason, has said he will reflect the opinion of many party members and vote against breaking off the negotiation. The government’s majority is however still secure. One who voices dismay in no uncertain terms is Benediktsson’s fellow party member ex prime minister Þorsteinn Pálsson who calls the change of course “the greatest political betrayal ever” in Icelandic politics. Pálsson is a respected commentator and many well-known Independence party members from the business community who side with him. In addition, Iceland also now has its very own version of Sarah Palin. Last week, Progressive MP and chairman of the budgetary committee Vigdís Hauksdóttir stated during a radio debate: “There is famine in Europe now” and later said that Malta is “a self-governing zone within a larger country. It is not a country.” Before these remarkable statements her most memorable statement had been (during a TV interview on earlier promised action on the health service “at once” her party were in power) that the phrase “at once” was an “elastic concept” – a novel and highly creative interpretation that has now turned into a saying in Iceland. By stepping in to make changes at the CBI the government has effectively kicked the CBI off the field of any major decisions regarding the estates of the collapsed banks and ultimately of the capital controls for some time, probably most of this year. This is seen a cause for worry in the business community tired of non-action on the capital controls. The bigger companies, often with foreign operations that ease the pain of the controls, find their way within the controls but smaller and medium sized companies are complaining loudly. The situation now is of completely opacity as to the procedure. Also there is a complete lack of policy as to where the government is heading with the CBI. It is unclear who will come up with proposals, unclear what the government policy is (some indication that the FME, financial supervisory authority, might be put under the CBI as it was until 1998) and it is also unclear as to what the criteria will be for hiring a new governor and if there will be more than one governor. And obviously it is completely unclear as to how long all this will take and when new governor(s) might be in place. Will the past replace the future? Generally, countries where the government meddles in matters of the central bank do not fare well. Right now, it is not only the Icelandic government that is creating such headlines but also the governments in Hungary and Nigeria. Not exactly countries that Iceland has been comparing itself to over the years. The fact that the CBI had criticised the “correction” – debt write-down for borrowers who could afford their loans and consequently had not profited from earlier write-downs by the previous government – was obviously a matter of great irritation to the prime minister. This ill-prepared intervention against the CBI has instigated a feeling in Iceland that the country is about to be steered back to the past where all public institutions and state-owned companies were carved up between the political powers. People were chosen to leading offices of power not according to merits but according to party affiliation. It came as a great surprise when Benediktsson recently appointed a young ex banker, Halla Sigrún Hjartardóttir. She has no previous experience of bank supervision but is an investor with rumoured connections to wheeling and dealing connected to the oil company Skeljungur. Not exactly a career similar to her opposite numbers in the neighbouring countries. The question is if this was only the first of similar nominations. The question is if old politicians will now be put into power as once was the rule rather than the exception. Might ex prime minister Davíð Oddsson become the chairman of the board of Landsvirkjun? And will his successor as party leader and later prime minister Geir Haarde. So far, the rumours are utter speculations but they indicate a state of mind prepared to see the past turn into the future. It remains to be seen if the strong feeling of the political past being projected into the future materialises. What clearly lives on from pre-collapse Iceland is the effect of the old banks’ operations, both its earlier practices and that most of the big borrowers still have access to considerable assets. Post-crisis bankrupt companies with humongous debt and hardly any assets (left) shows how assets did migrate out of these companies to somewhere mostly out of sight and reach of administrators. Most of the well-known holding companies, supporting the ownership of the major shareholders of the banks have followed this pattern, i.a. Novator, Baugur, Exista, Fons etc. This alleged migration of wealth out of sight was facilitated by the banks’ lenient lending practices: the banks took all the risk, the favoured borrowers got covenant-light loans. 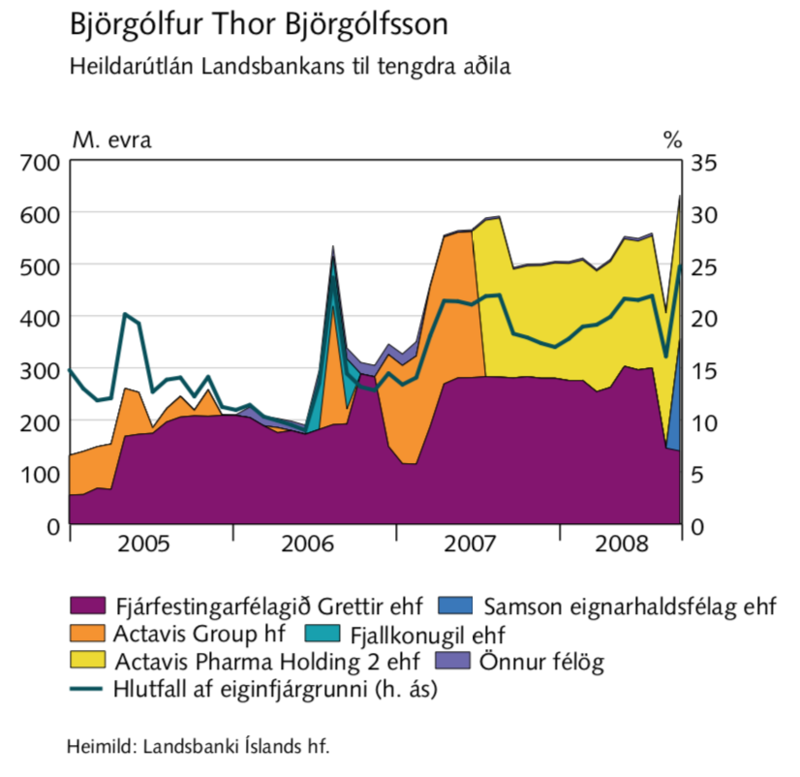 The clearest shift of risk took place during the winter of 2007 and 2008 when foreign banks, reacting to falling share price in the Icelandic banks, initiated margin calls affecting almost all of the big Icelandic bank shareholders who had placed their Icelandic bank shares as collaterals with foreign banks. The Icelandic banks, rather than seeing their shares flood the market evidently precipitating further falls in share price if not a total meltdown, stepped in and increased their lending to these shareholders. By Easter 2008, this shifting of risk and rapidly increased exposures was over and done with. In only a few months these moves, well documented in the SIC report, hugely increased the Icelandic banks’ already considerable exposures to their largest shareholders and their business partners, in some cases going over legal limits (though in some cases the banks’ lending hovered under the legal limits by abstruse definition of “related parties”: i.a. Glitnir did not consider Jón Ásgeir Jóhannesson and his wife as related parties nor did Landsbanki classify Björgólfur Guðmundsson and his son Björgólfur Thor Björgólfsson as related parties). What is at stake in the coming months and years? The banks have amassed a great amount of assets that will be sold. Already, there is anecdotal evidence that the practice from the old banks, of issuing loans to favoured clients against shares with non-too punishing haircut, is abounding. After all, the banks do want to lend money and inside capital controls bad practices can fester. The most prized assets, already for sale, are the two new banks, Íslandsbanki and Arion, owned by foreign creditors. Most likely these assets are highly coveted by certain forces in Iceland where banks have always bastions of political power and centres of handing out assets to favoured clients. How the foreign-owned ISK assets of the estates – not only if Glitnir and Kaupthing but also of Straumur and Icebank – will be dealt with decides to a certain degree the price tag on Íslandsbanki and Arion. Any government action, affecting the price, such as converting all foreign assets into ISK/paying foreign cash out in ISK will be of huge interest to Icelanders with money and ambition to buy into Íslandsbanki and Arion. It is no understatement that the sale of Arion and Íslandsbanki will greatly affect the business climate in Iceland in the coming years and possibly decades. If these assets could be sold on the cheap, aided by pension funds willing to act as silent owners by the side of active investors, the past might indeed be the future, not only in politics but also in the business community. By the end of 2012 both Glitnir and Kaupthing had presented the CBI with drafts of composition. The matter is still unsolved. Most of last year was lost to election and then a run-in time for the new government. That year went by without any bringing any clarity as to the abolition of the capital controls and the steps needed to solve the problem of the foreign-owned ISK assets. Now the CBI is in limbo. What will creditors do when faced with an uncertain future of the CBI and an uncertain effect on how to resolve the problem of the ISK assets in Iceland? The creditors have various possibilities. Do they deem the government to be hindering access to the estates’ fx assets? If so, they could try to sue the Icelandic state abroad, i.a. in London. Argentina is the scare example of a country that for years has been kept under pressure from creditors. Not necessarily the Icelandic saga any time soon. Some drama might come later. Then, on the other hand there will not necessarily be any big drama: some of the creditors might just silently choose to sell their claims. In troubled times the buyers are investors looking to recover their claims by litigating every penny, or in this case, every króna. Ireland is now back in the market though the country is by no means on a safe ground yet. When will Iceland be in the market to refinance its debt? Judging from the government’s tendency to prolong problems instead of solving them it might take a while. Even a long while. For Icelanders locked inside capital controls there is yet another “if”: if Iceland will be further isolated from other countries the effect of the growing income difference of the mobile and well educated classes compared to the neighbouring countries might take its toll. As counts for much in Iceland the changes are very gradual. Lost opportunities or loss of work force who does not return to Iceland after studies abroad is difficult to calculate. * In his letter to CBI employees, Guðmundsson noted that he should have been alerted before midnight February 19. However, he was apparently not notified until evening of February 20. It remains to be seen if this will pose a problem for the government: if Guðmundsson will/cannot reapply, i.e. he could possibly claim that he should be paid for the rest of his term. Judging from his previous dealings regarding his salary, where Guðmundsson maintained earlier promises had been broken – he lost a court case on this issue – Guðmundsson will no doubt explore his position were he to lose his job. See below for recent three blogs on power and politics in Iceland. The latest blog on capital controls is here.